In the mail today was another canvas autograph card from 2007-08 Chronology, courtesy of fellow UK collector Will Clapton. 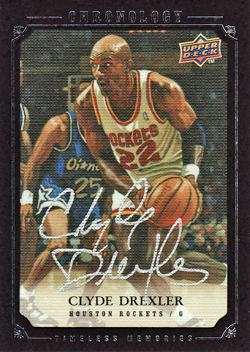 On this occasion it is a 'Timeless Memories' version featuring Clyde Drexler and records his feats in the 1994-95 post season that led to his NBA Championship victory with the Houston Rockets. This new addition sits well alongside the 'Legend' version I pulled from a box I opened back in 2009. Cards from this set are becoming ever more expensive, as collectors increasingly come to realise how unique the design and strong the production was from Upper Deck and I was fortunate that Will was happy to let me purchase this from his collection. Glad you received the card safely. I sold a few Chronology autos last week and I miss them already. However, it would take too much money to complete the entire set (there are two Jordan autos, three Kobes, etc). 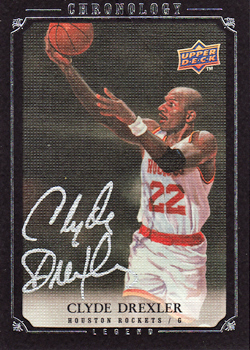 They have to be my all-time favourite cards though - they feel like a mini piece of basketball history and artwork rolled into one.